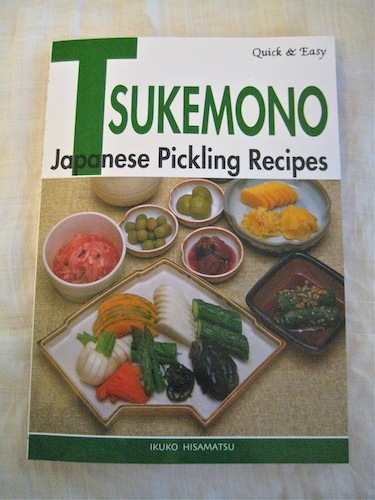 Whenever my husband’s friend and colleague Kuniko visits from Japan, she brings me a gift of tsukemono or “pickled things”. I have always enjoyed the crunchy rainbow of vegetables that are an integral part of almost every Japanese meal, including breakfast. But this time, her gift was especially poignant. Kuniko left her Kyoto home in that limbo moment after the earthquake, but before the devastation of the tsunami was yet known. The simple package of pickled vegetables reminded me how sometimes in the midst of horrors, it may be the mundane little moments of daily life that we either long for or that help us through the toughest times. 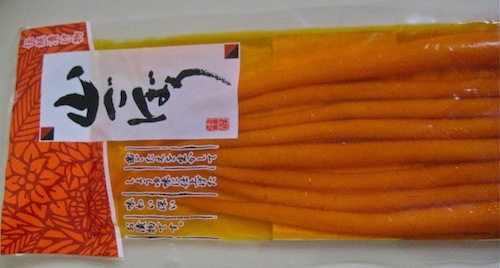 Tsukemono is commonly made with cucumbers, turnips, carrots, mushrooms, burdock, peppers, celery, cabbage, eggplant, shallots, greens, ginger, garlic, kumquats and Japanese plums. There are several traditional ways to prepare the vegetables (including burying them in a prepared bed of rice bran), but a simple brining solution of vinegar, salt and sugar can produce instant or overnight pickles. 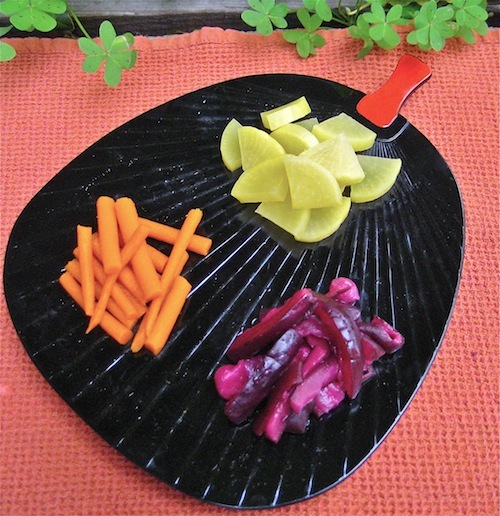 This technique does not require sterilization or canning, but the pickled vegetables are meant to be eaten in a few days. When the urge for crunchy tsukemono hits, I usually head straight to my wonderful neighborhood resource for all things Japanese, Berkeley’s Tokyo Fish Market. They carry a large selection of tsukemono, including a dozen kinds of daikon radish, one of my favorites. I recently noticed, however, that the labels on these delicacies list food coloring and preservatives. So I ambled across the parking lot to Tokyo Fish Market’s gift store and bought a copy of the classic Tsukemono book by Ikuko Hisamatsu, filled with helpful step-by-step pictures and easy to follow instructions. 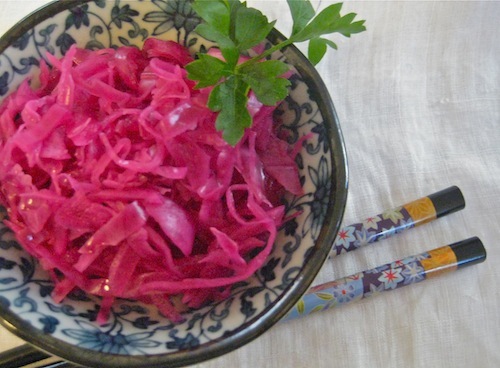 I made a tangy fuchsia colored Vinegared Red Cabbage with onions from the book. 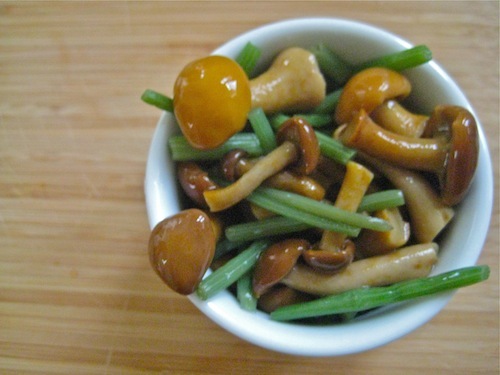 Then I checked my favorite Japanese cuisine blog, Just Hungry by the prodigious author, Makiko Itoh, who somehow also writes another beautiful blog called Just Bento , (a must if you love the cute food movement.) 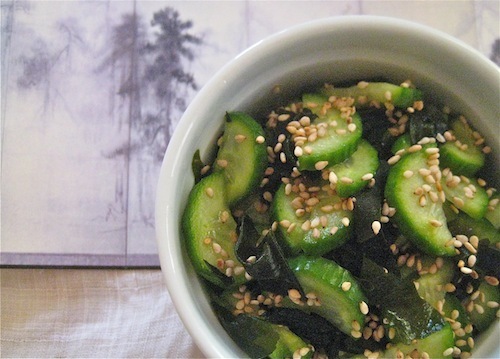 I made Makiko’s Sweet and Sour Cucumber with Wakame Seaweed Recipe: And added iri goma (toasted sesame seeds) for a lovely crunch. My heart goes out to the Japanese people. It seems it will be a long time before their lives can be filled by those everyday moments that we simultaneously cherish and take for granted — like making pickles. This entry was posted in Japan and tagged Japanese pickled vegetables, Japanese pickles, Makiko Itoh, Tokyo Fish Market, tsukemono. Bookmark the permalink. This looks so delicious. Reminds me that I still have half a head of red cabbage somewhere in my fridge…I’ve experimented with all kinds of slaw recipes lately, but it didn’t even occur to me that there might be a Japanese variety – I think I need to get that book! Yes, crunchy and refreshing and easy too. It also gets better after a day or so in the fridge.